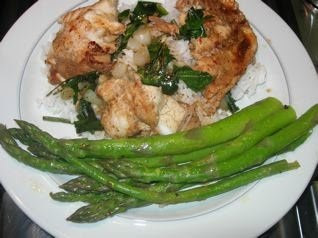 Photo (Lexi Van de Walle): Blackfish with a Kick, served over basmati rice and topped with sauteed ramps. Steamed asparagus and lemon vinaigrette on the side. A few Wednesdays ago, I introduced myself to the farmers, bakers and fishmongers at the Dag Hammarskjold market. Among them I met one of Rick Lofstad's staff of Hampton Bays Pure Vida who is here from Costa Rica and working the markets selling fresh caught local fish direct to the consumer at several farmers markets in the area. I don't usually buy fish at the farmers markets in city because I'm usually not going directly home, I'm eating out that night or the market I'm shopping at doesn't sell fish. I bought a few tasty treats, including a nice plump looking pound fillet of Blackfish (1.2 pounds). It was the end of the day and normally I would have bought fluke or flounder from a LI Fishery as fluke is my favorite local fish, but it was all gone. Was I glad. The blackfish was a really special treat -- a white flesh that's firm with a flavor similar to sea bass. My preparation was delicious as well. On the way out, I grabbed a few bunches of wild ramps and some asparagus to go with the blackfish. Often described as wild leeks, ramps are across between an onion and garlic and available at farmers markets in late April and early May. Serve over white rice with greens, such as sauteed spinach or sauteed ramps. Trim roots and any brown spots off of the ramps, wash and dry. Slice finely, as you would a scallion, and saute in olive oil until wilted. Ramps go well with rice, pasta, and the Blackfish with a Kick recipe that I made. Just a few days after cooking up a beautiful dinner made with local Long Island blackfish which was probabaly caught near the jetties in the Shinnecock Inlet, this article came across my desk reminding me of how hard fishermen work and the challenges they are up against, especially in New York, in the balance between protecting the oceans and their livelihoods. I'm glad Congressman Tim Bishop and Senator Gillebrand are listening. Against the backdrop of a rusting fleet, commercial fishermen met with legislators at the Shinnecock Commercial Dock Saturday to plead for changes in quotas they say have crippled a once-thriving Long Island industry. "Some of these guys haven't fished in a year," Sal Palacino, of Hampton Bays, told Rep. Tim Bishop (D-Southampton) and an aide to Sen. Kirsten Gillibrand (D-N.Y.). "Some of these boats, if we don't get help, are destined for the scrap yard."